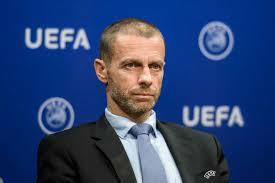 December 5 – UEFA president Aleksander Ceferin has stuck another barb into FIFA’s $25 billion proposal to change the landscape of world football with its plans for an expanded Club World Cup and a revamped Nations League, saying the whole of European football is against the idea. The plans, brainchild of Ceferin’s opposite number at FIFA Gianni Infantino, could well be approved at the next FIFA Council meeting in March when the findings of an evaluation panel will be released, but Ceferin says European stakeholders are speaking with one voice. At the same news conference, Ceferin laughed off Conmebol’s recent suggestion of playing the World Cup every two years, saying that once again his members had not been consulted. On an unrelated subject, UEFA has been accused of double standards by appearing to give the go-ahead for the decisive leg of the Copa Libertadores to be played in Madrid whilst at the time rejecting La Liga’s controversial plan to play one of their fixtures (Barcelona versus Girona) overseas in Miami in January. Rejecting this interpretation, Ceferin said: “On the Copa Libertadores, I got a phone call and we got some emails and letters from Conmebol, the South American confederation, and they said they can’t organise the event for security reasons. “Of course, my opinion is that we have to help our colleagues from other confederations if we can organise an event that they cannot – that’s one thing.